Chanukah, meaning “dedication” in Hebrew, refers to the joyous eight-day celebration during which Jews commemorate the victory of the Macabees over the armies of Syria in 165 B.C.E. and the subsequent liberation and “rededication” of the Temple in Jerusalem. The modern home celebration of Chanukah centers around the lighting of the Chanukah, a special menorah for Chanukah; unique foods, latkes and jelly doughnuts; and special songs and games. Chanukah is the Jewish eight-day, wintertime “festival of lights,” celebrated with a nightly menorah lighting, special prayers and fried foods. The Hebrew word Chanukah means “dedication,” and is thus named because it celebrates the rededication of the Holy Temple (as you’ll read below). Also spelled Hanukkah (or variations of that spelling), the Hebrew word is actually pronounced with a guttural, “kh” sound, kha-nu-kah, not tcha-new-kah. When they sought to light the Temple’s Menorah (the seven-branched candelabrum), they found only a single cruse of olive oil that had escaped contamination by the Greeks. Miraculously, they lit the menorah and the one-day supply of oil lasted for eight days, until new oil could be prepared under conditions of ritual purity.In the second century BCE, the Holy Land was ruled by the Seleucids (Syrian-Greeks), who tried to force the people of Israel to accept Greek culture and beliefs instead of mitzvah observance and belief in G‑d. Against all odds, a small band of faithful Jews, led by Judah the Maccabee, defeated one of the mightiest armies on earth, drove the Greeks from the land, reclaimed the Holy Temple in Jerusalem and rededicated it to the service of G‑d. To commemorate and publicize these miracles, the sages instituted the festival of Chanukah. At the heart of the festival is the nightly menorah lighting. The menorah holds nine flames, one of which is the shamash (“attendant”), which is used to kindle the other eight lights. On the first night, we light just one flame. On the second night, an additional flame is lit. By the eighth night of Chanukah, all eight lights are kindled. Special blessings are recited, often to a traditional melody, before the menorah is lit, and traditional songs are sung afterward. Since the Chanukah miracle involved oil, it is customary to eat foods fried in oil. 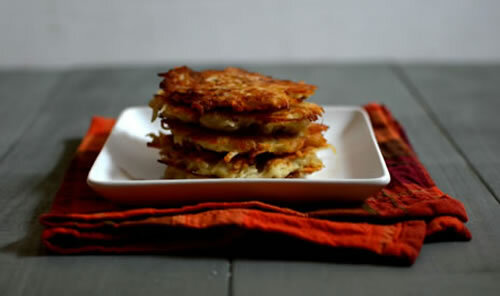 The Eastern-European classic is the potato latke (pancake) garnished with applesauce or sour cream, and the reigning Israeli favorite is the jelly-filled sufganya (doughnut). Find the perfect Chanukah recipe.